We start with an image varying from white at the left to black at the right. 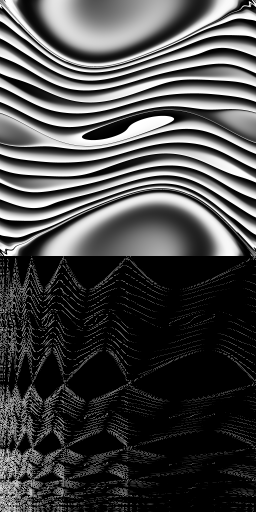 The image at the top right shows what happens to this image when the standard map is applied for 20 iterations. This map is a "chaotic map" which is an abstraction of many dynamical systems. It is mixing in some regions, but is not mixing in the ergodic theory sense. The bottom image shows the magnitude of the Haar wavelet basis coefficients of the top image. Wavelets are a generalisation of the Fourier transform: typically one looks for expansions of a suitable Hilbert space of functions, which reflect both spatial and frequency data. The classical Fourier transform only captures frequency data: for this image, we would lose interesting information about the spatial mixing. Within the Analysis group, Dr Kisil and Prof Partington study wavelets. Prof Partington is interested in the abstract Hilbert space theory of wavelets, as well as applications to signal processing and control theory. Dr Kisil is interested in applications to Mathematical Physics. Ergodic theory in applied mathematics typically studies the iterations of a single map, or a one-parameter (semi)group of maps. In pure mathematics, it is interesting to generalise this to the actions of general groups on spaces. This leads to an incredibly powerful way of forming interesting topological algebras: the crossed product construction in von Neumann algebras. We see that a single image has links to much work done at Leeds! Functional analysis is a subject which sits in the middle of modern mathematics, being informed by many different areas, and having diverse applications both in mathematics, and in wider fields. Image created by Matthew Daws, 2009.